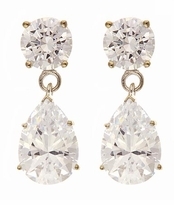 The Oprah Style Pear Cubic Zirconia Tear Drop Earrings are a classic design that has been popularized because you have seen this style worn by the popular celebrity OPRAH WINFREY. 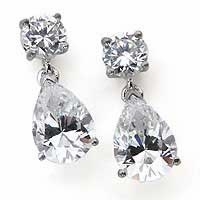 These earrings feature a brilliant round diamond look top cubic zirconia stone followed by a diamond look pear cubic zirconia drop. Two versions are offered in this tear drop style that include a small version that includes a .75 carat round cubic zirconia followed by a 2 carat pear cubic zirconia drop and a medium version that includes a 1 carat round cubic zirconia followed by a 3 carat pear drop. Both versions are available in your choice of pear stone colors that include lab created man made ruby, sapphire and emerald, in addition to pink, canary or diamond look cubic zirconia stones. Choose from 14k white and yellow gold, 18k white and yellow gold and luxurious platinum. Our Russian formula diamond quality cubic zirconia is hand cut and hand polished to exact diamond specifications for a stunning finished product. For further assistance, please contact us directly at 1-866-942-6663 or visit us via live chat and speak with a knowledgeable representative.